How To Take A Screenshot On Windows 10, 8, 7 PC, Mac, Android Phone, iOS iPhone, iPad, iPod? 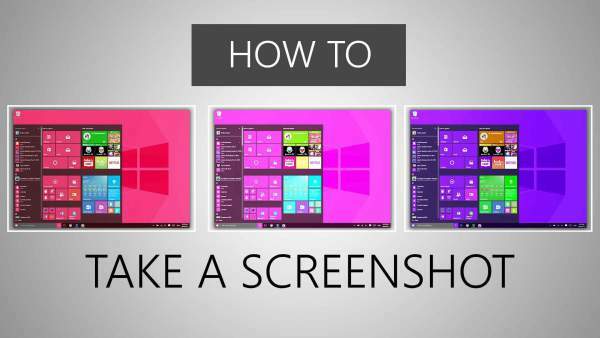 How To Take A Screenshot on Windows 10 PC, Mac, Android, iOS Phone: What is a screen shot? Basically, a screenshot acts as an image itself. It reveals what is mentioned on the screen. Here, we will help you to know about taking a screenshot in Windows? It is completely possible to take a screenshot on any of the platforms and that includes Windows too. It holds in a ‘Bulit-in’ option. This option helps to perform basic tasks with good performance. On the other hand, there are some 3rd party programs available that provide more features and functions. Take a screenshot and store it as a file. Capture a screenshot without storing it as a file. Take a screenshot of just one window. You may check the print screen button on your keyboard. It is written as ‘PrtScn’ or ‘PrntScrn’ or ‘Print Scr’. For PC users, it would be appearing between F12 and Scroll Lock buttons. For laptop users, use the ‘Function or ‘Fn’ button for accessing the Print Screen option. After you click the button, no reaction would come up onto the screen. Don’t worry. Your screenshot has been taken and stored in the clipboard. Now, you need an image editing tool such as MS Paint. Open the app, paste the snap and save it as a file. Related: How To Fix 403 Forbidden Error? How to store the screenshot as a file? Press the keys- ‘Windows Logo + PrtScn’. For tablet users, press the buttons- ‘Windows Logo + Volume Down’. For laptop users, press the keys- ‘Windows Logo + Ctrl + PrtScn’ or ‘Windows Logo + Fn + PrtScn’. The display screen will get darker for a few seconds. In the default ‘pictures’ folder, you can check that the screenshot is stored as a file in a folder named ‘Screenshots’. NOTE: Your screen will get darker if the option of ‘Animate Windows when Minimizing and Maximizing’ is enabled. How to take a screenshot without storing it as a file? Here are the steps required to perform the function. For laptop users, press the keys- ‘Alt + Fn + PrtScn’. The screenshot will be taken. Go to the image editor, word processor or any other program you wish to use. Open the program and select the option of Edit > Paste. How to take a screenshot of just one window? The steps are mentioned below. Press on the title bar of some particular window. Press the keys- ‘Alt + PrtScn’. Your screenshot has been taken of the active window and it is copied to the clipboard. Open your pet image editor or word processor which you want to use for posting it. Related: How To Download YouTube Videos? How to take a screenshot of some part of the screen? Press the keys- ‘Windows + Shift + S’. The display screen would become grey and the cursor mouse will be changed. Click and drag the part of the screen you want to store as a screenshot. The screenshot has been taken of the part you wish to capture and the same is copied to the clipboard. Open any program you wish to use for pasting the screenshot. For this, press ‘Ctrl + V’ or choose ‘Edit > Paste’ option. The most important thing to be kept in mind is that this only supports Windows 10 Creators Update. Talking about the earlier versions of Windows, I’d like to mention that there this happens to be just a part of MS OneNote app. As the Creators update arose, here Windows 10 itself holds this shortcut. What is a Snipping Tool? This tool is used to take screenshots of the whole screen, an activated window, a free-form area, or rectangular area. Windows has been supporting the ‘Snipping Tool’ for a long period of time. Firstly, the Windows Vista introduced this tool. Later on, it hasn’t been modified so long. Only a few bug fixes took place in the tool. The snips you capture can be glossed up by colorful pens or you may highlight it. Plus, the same could be saved as an image or some MHTML file. You can also go for the email option for the snips. The tool is available for Windows Vista, Windows 7 or Windows 8. But it has one limitation. What could it be? Well, the tool is not able to take screenshots in which some mouse movements occur. There are some screenshots that may include mouse movements such as, Pop-up menu or tooltips. In such a case, you need to opt the Print Screen function. The snipping tool available in Windows 10 offers a ‘Delay’ option. With the help of this option, you can take screenshots of the pop-up menus and tooltips. All you need to do is press the ‘Delay’ option in the tool. When you will go through the drop-down list, there you can fill up the number of seconds you want as a timer. Make a selection about the type of snip you wish to capture. Press the arrow from Next to New. There’ll be appearing four options: free-form, rectangular, window or full screen. Is it possible for Windows 10 to hold a record of gameplay footages? In Win10, you’ll be finding game DVR potential. This helps you to record the gameplay clips. Plus, you can also capture screenshots of the Windows PC games. In the game bar, you’ll be receiving screenshots in PNG format. The same would be stored in the format- ‘C:\Users\ [your username]\Videos\Captures’. Now, wait! You need to install the Xbox app before beginning with the game bar. In the Xbox app, open the settings. In the Game DVR, switch to ‘Take screenshots using Game DVR’. Now, you need to put the keyboard shortcuts you wish to over there. At the time of taking a screenshot, you may use the keyboard shortcut you applied in the above step. By default, the shortcut is ‘Windows key + G’. A box will appear with- ‘Yes, this is a game’ written. In order to capture a screenshot, you need to press- ‘Camera Icon’ or ‘Win + Alt + PrtScn’. Every function or method structured inside the Windows holds some advantages and limitations. In case, you are capturing a large number of screenshots. Plus, if you wish to have a more flexible performance. You can choose a third party tool for this. Can you empty some amount from your pocket? In such a case, you must go with- ‘Snagit’ by Tec Smith. This tool is one of a foremost secure one with the help of which you can take screenshots easily. Moreover, the tool offers a large number of features and functions. With the help of these features, you may select specific windows, capture region snapshots or take a screenshot of the whole text scrolling windows. This also enables the user to make short clips. You can also gloss up the screenshots, draw shapes and charts. The tool would make you do as many things as you wish on the screenshot. We strongly recommend you to go with this tool as it appears to be one of an impressive tool. The habit of taking a huge number of screenshots? In such a case, you must use this tool. You will like it. If you are using a Windows Surface device, then you can press Windows Logo + Volume Down to take a screenshot of the entire screen. Windows Logo is a touch button at the bottom of the Surface screen and Volume Down is a physical button on the side of the tablet. As you press them at the same time, the screen will dim for less than a second and the screenshot will be automatically saved to the Pictures -> Screenshots folder. Hold down ⌘ command and shift and press #3. Using this step, the Mac will capture the entire screen and save it as a file on the desktop with a file name similar to “Screenshot 2018-08-04 at 09.55.10 AM.png”. Then, use the mouse to draw a rectangle to specify what you want to capture or press the space bar and then click on something (e.g. a window) to capture it. The file will now appear on the desktop and name will look like “Screenshot 2017-08-03 at 08.45.00 AM.png”. Hold down ⌘ command and shift and press ^6. It will save it as an image file on the desktop. How can I have a screenshot in the clipboard instead of a file? Hold down control together with any of the combinations mentioned above. The Mac takes a screenshot and copies it to the clipboard (instead of saving it as a file). How to paste the clipboard image into a document or something? Hold down ⌘ command and press V. The command will now insert the screenshot into a document or image in which you want. How can I take a screenshot using Preview? With Preview (see the previous question) you can save your screenshots in JPG, TIFF, PDF, and other file formats. How can I take screenshots using the command line (“Terminal”) for more flexibility? Hold down Sleep/Wake then immediately press and release Home. The screen flashes white. Your device captures the entire screen and saves it as a photo. Then, it will now appear in the Photos app. Since the iPhone X doesn’t have a home button, the above method doesn’t work. Here’s how to capture a snap. Open the app or go to the screen which you want to capture. Set it up as you want in the snap. Press and hold the Side button on the right side of the Apple phone. Click/Press the Volume Up button at the same time. The screen will flash white with a camera shutter sound. It is taken and saved. The screen flashes white. Your device captures the entire screen and saves it as a photo. Now, it will appear in the Gallery or Photos app of Samsung/OnePlus or whatever the brand is. It still does not work. Why? On most devices, you need Android 4.0 or later. However, you could try using an app instead. Check: Free VPN Services for PC. Hope the above guide helps you to know How To Take A Screenshot On Windows 10, 8, 7 PC, Mac, Android Phone, iOS iPhone, iPad, iPod? Stay tuned to TheReporter Times for more tech solutions. Previous articleHow To Fix 403 Forbidden Error (You Don’t Have Permission To Access / On This Server): What Is It and Its Solutions?